If you're on a mission for a casual yet chic ensemble, opt for a black leather biker jacket and navy floral skinny pants. Both items are totally comfy and will look fabulous together. Wearing a pair of Saint Laurent anja pointed toe pumps is a simple way to add some flair to your look. If you're searching for a casual yet absolutely chic ensemble, try teaming a black and white horizontal striped long sleeve blouse with black capri pants. Both items are totally comfy and will look fabulous paired together. 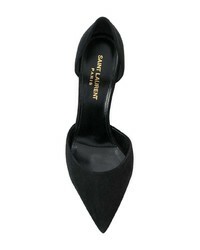 Bump up the cool of your look by finishing off with Saint Laurent anja pointed toe pumps from farfetch.com. If you don't like putting too much effort into your getups, opt for a green shirtdress. Bump up the cool of your ensemble by wearing Saint Laurent anja pointed toe pumps. If you're searching for a casual yet stylish getup, dress in a black sequin blazer and navy skinny jeans. Both pieces are totally comfy and will look fabulous together. Elevate your getup with Saint Laurent anja pointed toe pumps. If you're after a casual yet stylish outfit, choose a black fur jacket and blue ripped skinny jeans. Both items are totally comfy and will look fabulous together. To add oomph to your look, finish off with Saint Laurent anja pointed toe pumps. If you're on the hunt for a casual yet absolutely chic outfit, go for a grey knit vest and burgundy skinny pants. Both items are totally comfy and will look fabulous paired together. Wearing a pair of Saint Laurent anja pointed toe pumps is an easy way to add some flair to your outfit. If you're looking for a casual yet totally chic outfit, try teaming a grey print crew-neck sweater with navy skinny jeans. Both items are totally comfy and will look fabulous together. And if you want to instantly up the style of your look with one piece, add Saint Laurent anja pointed toe pumps to the equation. If you're hunting for a casual yet totally stylish ensemble, try pairing a black long sleeve t-shirt with navy flare jeans. Both pieces are totally comfy and will look fabulous paired together. To add oomph to your outfit, finish off with black suede pumps. If it's comfort and practicality that you're seeking in an outfit, make a burgundy velvet bodycon dress your outfit choice. Throw in a pair of black suede pumps to va-va-voom your outfit.